Today, I tackle a couple excellent young adult thrillers. Don't start these right before bed. 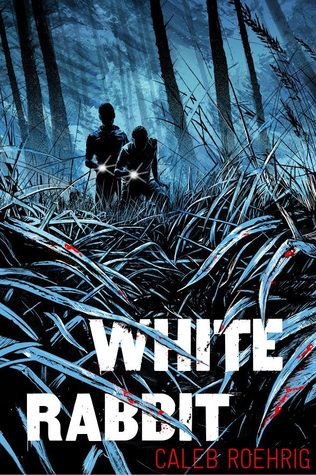 WHITE RABBIT is a murder mystery thriller, something ripped right off the screen. Meet Rufus. He's having a bad night. His stepsister April calls him in a panic, and he rushes to her aid only to find her friend's snazzy lake house in disarray and a dead body with a knife sticking out of it. Oh, and his ex-boyfriend tags along too. While the blood is on April's hands, she claims to be innocent. To clear her name, they have to find the killer. Before they become the next vicim. Honestly, I was a little disappointed that there were no Alice in Wonderland references (or at least THE MATRIX, come on! ), but Caleb makes up for it in suspense, charm, and basically everything else. Rufus was relatable from page 1. You really feel for him, being scorned by his stepfather and rejected by an ex-lover who won't even acknowledge him. The romantic tension between him and Sebastian steams up the pages. Their transition between hatred and misunderstanding to familiar intimacy scaffolds a rather generic but very solid plot. Rich is dead. Drugs may be involved. All of his frineds had motive, and all are hiding something. The twists and turns kept me racing through pages, frantic to solve the case. I didn't, which is usually a good sign that the author has surprised me, but I was able to piece together hints I'd missed, which is a good sign they've created a good twist instead of throwing in random shock value. WHITE RABBIT is the spiritual successor of slashers like SCREAM and I KNOW WHAT YOU DID LAST SUMMER, full of secretive suspects, surprise jump-scares, and a touch of humor and romance to prevent the plot from becoming truly dark. While the thematic punch of the drugs is a little lacking, the mystery is compelling even without this extra layer. It was exactly the book I needed to cure my craving for murdery suspense. I'm already on board to read Caleb's debut and his upcoming, DEATH PREFERS BLONDES. 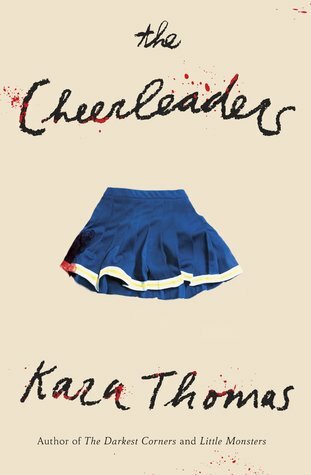 THE CHEERLEADERS is my second Kara Thomas thriller, and it definitely won't be my last. Thomas borrows from the annals of murder mystery, procedural, and psychological suspense but adds character-driven narration, creating a suspenseful and human alternative to what can be a cold genre. Like her debut THE DARKEST CORNERS, THE CHEERLEADERS' claustrophobic setting is a small town, where everybody knows the story of the five dead cheerleaders but no one knows the truth. Two dead in a car crash. Days later, two murdered. And then a suicide. All the paths crisscross Monica, sister of the girl who died by suicide, stepdaughter of the cop who shot and killed the murderer. Monica, still reeling from a torrid secret love affair with an older man. Monica, who's deadbeat alcoholic father vanished without a trace. Monica's conviction that her sister was actually murdered sets off a chain of events that unravels everything. I can't express how clever Kara is in her plotting. She begins with all of these scenarios surrounding Monica, seemingly unconnected, and then slowly ties them together. It's your typical case of "girl finds threatening note in her stepfather's desk saying the murderer he caught wasn't the killer. Girl decides to solve case on her own" only done perfectly, and bolstered by truly complex characters. I especially loved Ethan, an outcast who was expelled seemingly for making a hit list, but whose story is so much more profound. And Ginny, the quiet girl Monica befriends, who has her own reasons for wanting to solve the case. Caring for them amped up the stakes and made me truly fearful the more danger they were in. Between rooting for these characters and getting twisted up in the mystery, I was thoroughly enraptured by this book. Kara knows just when to reveal a detail, just when to drop a red herring. Her writing is succinct and fluid, and her reveals pack an emotional punch. And the best part is how truly clever she is. It was a case where I guessed the murderer, and was very satisfied that I was right. Except Kara STILL managed to throw in a few surprises that made total sense, but I never saw them coming. The whole ending portion is just a mindtrip. And don't worry: the way she treats suicide and grief is incredibly sensitive and meaningful. If you have any love for thrillers, read this book. It'll leave you shaking.